Three bridges cross the South Fork of the Cosumnes River and they all cross along the northern border of western Amador County. The easternmost bridge carries Tyler Road over the South Fork. 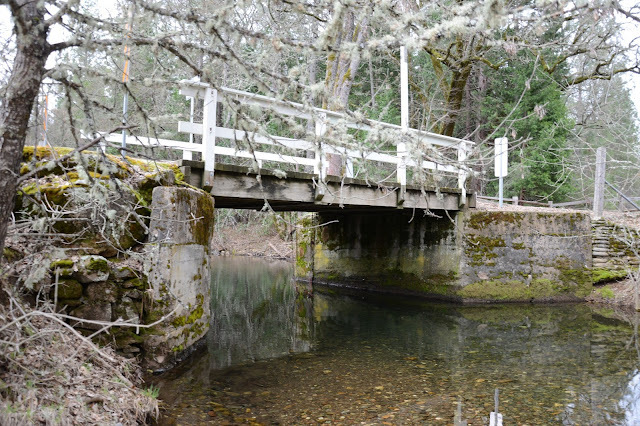 It's a single span timber bridge that was built in 1945 and improved in 1988. I was a little surprised that this bridge only carries 47 vehicles a day (as of 2003) since there are so few bridges over the river. The route classification is local (rural) and the sufficiency rating is 67.9 out of 100. I would imagine the improvements in 1988 included a new timber deck since the abutments appear old and without improvements. Amador County, California Bridges: Tyler Road across the South Fork of the Cosumnes River by Mark Yashinsky is licensed under a Creative Commons Attribution-NonCommercial-ShareAlike 3.0 United States License.